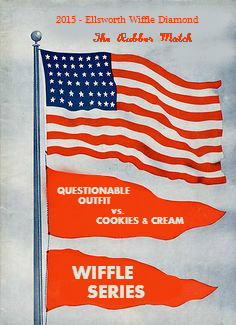 The fifth edition of the Ellsworth Wiffleball League Wiffle Series will begin today, as #1 seed Questionable Outfit will look to defend their 2014 championship against #3 seed and 2013 champions Cookies & Cream. This year’s series has been dubbed the “Rubber Match” as these two teams are meeting to decide the championship for the third consecutive year. Cookies & Cream stunned Questionable Outfit in 2013, sweeping them to win the title. 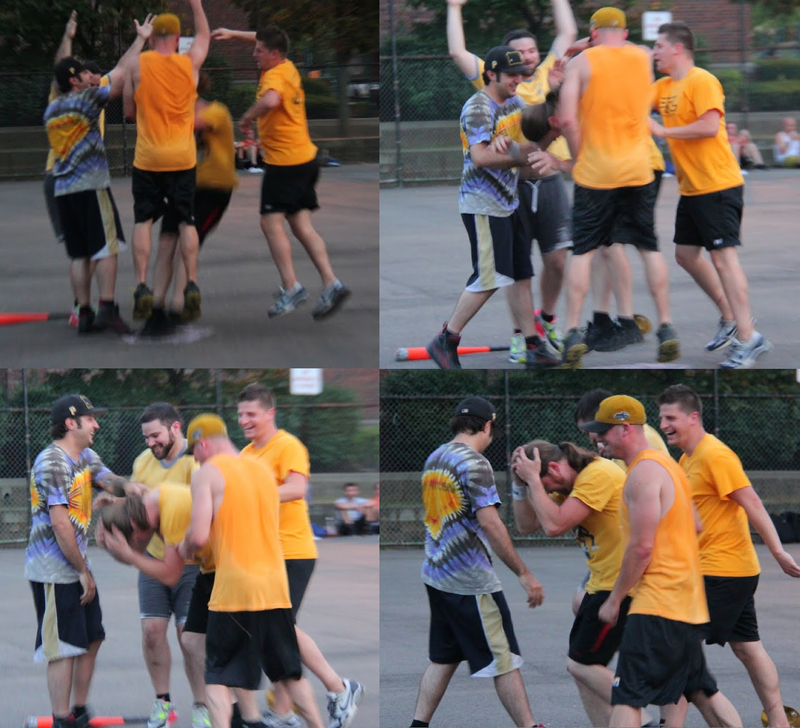 Last year, Questionable Outfit got revenge, as they topped Cookies & Cream in five games. This season, Questionable Outfit comes into the series as the heavy favorites as they attempt to become the first team in EWL history to repeat as champions. 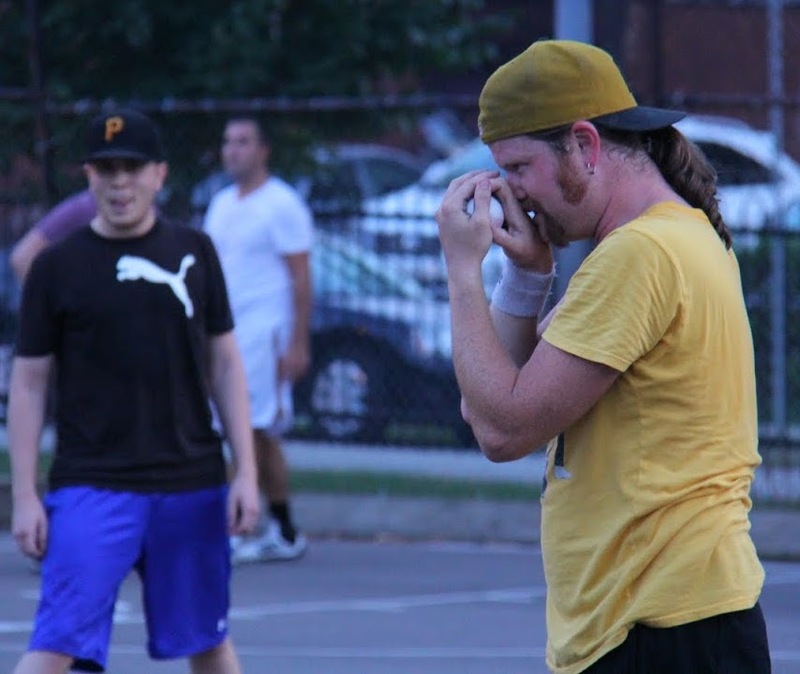 Both rosters are loaded with wiffle veterans, and both teams are familiar with the wiffle diamond’s biggest stage. 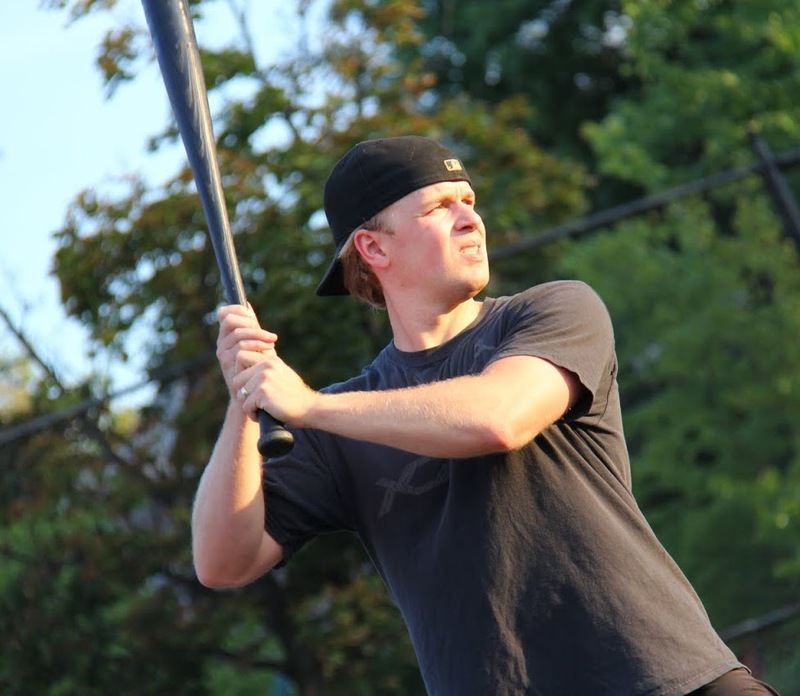 Joey, Dinger, Vassallo, and Guthrie will be playing in their fifth Wiffle Series, Blose in his fourth, and Bob, Mike, Reilly, and Mike in their third. 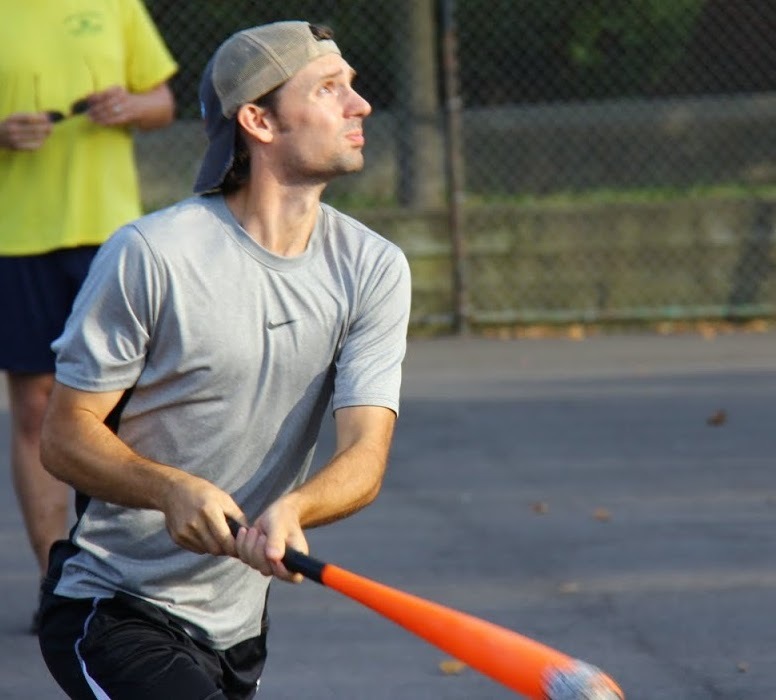 Guthrie is a two-time Wiffle Series MVP, and Blose and Bob have each been named MVP of the championship series as well. Games 1, 2, 3, and 4 will be played tonight, and if a team can sweep, a champion could be crowned tonight. 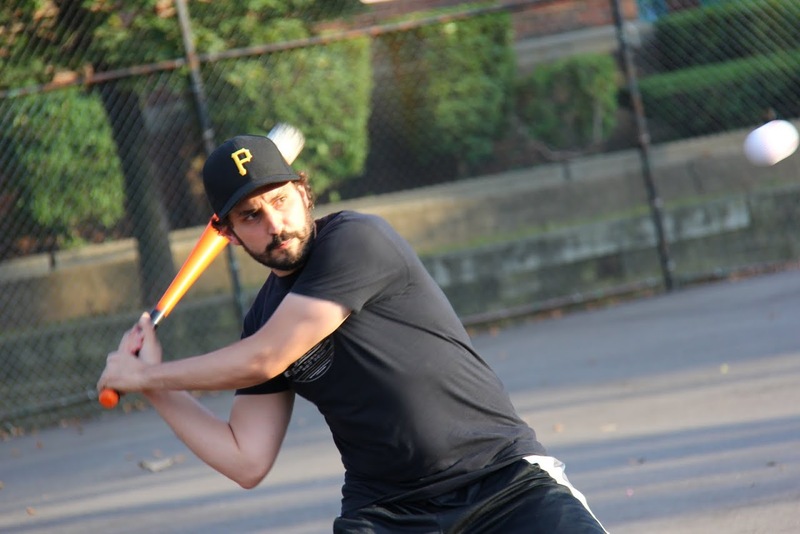 The action starts at 6:30PM on the wiffle diamond in Shadyside on Ellsworth Ave.
Vassallo drove in the first of 18 Cookies & Cream runs and led them on offense, going 5-for-6 with 2 singles, a triple, 2 home runs, 4 runs scored, and 3 RBI. 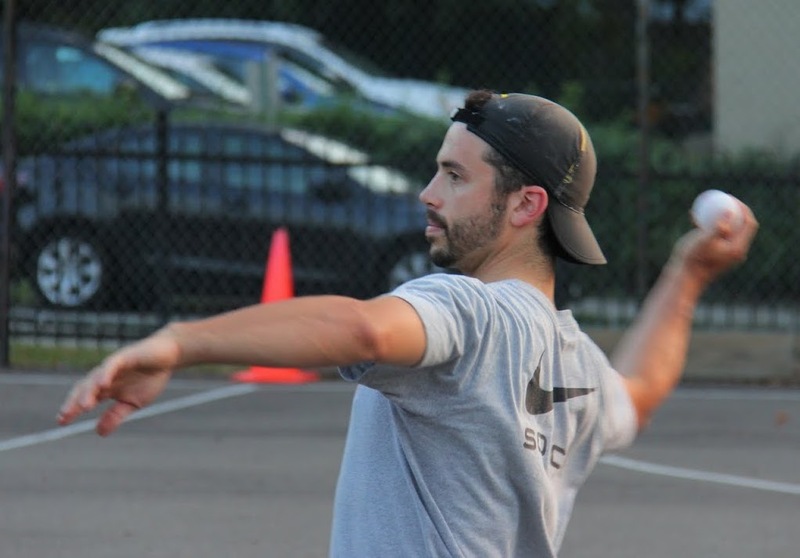 Cookies & Cream clinched a third consecutive Wiffle Series appearance and sealed their comeback in the best-of-five first round series with Eastbound & Dahn by winning game 5 in blowout fashion 18-1. Guthrie was unhittable, allowing only one base runner, and the Cookies bats were on fire as they stormed past Eastbound & Dahn. After losing game 1 and game 2 to walk-off home runs in the bottom of the sixth, Cookies scraped past Eastbound in game 3 to extend the series. They rolled in game 4, and they won even more decisively in game 5, winning three straight games to take the series. 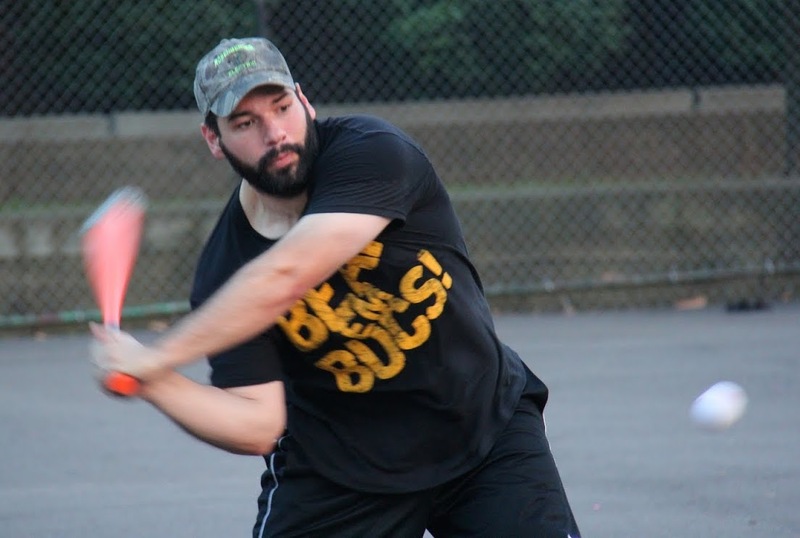 Despite being unable to put Cookies away in games 3 or 4, Eastbound & Dahn remained one win away from winning the series and having a shot at the championship. They returned to Christian as their starting pitcher. He had won game 1 in relief and narrowly lost game 3. He got off to a good start in game 5, retiring Joey and Blose in order for a scoreless inning. Cookies & Cream started Guthrie on the mound. He was hit hard in game 1 and earned a no decision and was the winning pitcher in game 3 despite a below average performance. He also started well, retiring Nate and Dustin consecutively in the bottom of the first, and the game was tied after an inning. Cookies would get on the board in the top of the second and break the scoreless tie. Guthrie started the inning with a double, and he scored from second when Dinger grounded out for the first out of the inning. Vassallo followed with a one-out triple, and he scored on a Joey RBI single to make the score 2-0. Blose then singled, and Joey scored from first to put Cookies ahead 3-0. Guthrie followed with his second double of the inning, scoring Blose, and the score was 4-0. Christian then retired Dinger to end the inning, and Eastbound trailed by four. Guthrie rolled through the bottom of the second, retiring the side in order. Up four runs, Cookies extended their lead in the top of the third. Vassallo led off the inning with a solo homer, and the score was 5-0. Joey followed with a double, and Blose drove him in with an RBI triple that made the score 6-0. Guthrie grounded out for the first out of the inning, but Blose scored on the play, pushing the lead to 7-0. Christian then retired Dinger to end the inning. Down seven, Eastbound got their first hit in the bottom of the third when Nate led off the inning with a solo homer to left-center. The bomb cut the score to 7-1, but it was the last and only hit Guthrie would surrender in the game. Dustin and Christian were retired to end the inning. Vassallo led off the to of the fourth with a single and moved from first to third when Joey followed with a single. The next batter, Blose, hit a shallow fly to left field. Dustin caught the ball and fired it to the mound, doubling up Joey, who had wandered off of first, for the second out of the inning. Guthrie continued to cruise in the bottom of the fourth, sending Ryan and Nate down in order. Up 7-0, Cookies & Cream put the game and the series to rest in the top of the fifth. They unleashed a seven-run inning fueled by home runs and Eastbound fielding errors, and it left little doubt that Cookies would be advancing to the next round. Guthrie led off the inning with a single, and he scored from first when Dinger followed with an RBI double, making the score 8-1. Vassallo followed with a single to put runners on the corners, and Joey singled in Dinger to make the score 9-1. Blose came to the plate with runners on first and second, and he hit an RBI triple, clearing the bases and extending the Cookies lead to 11-1. Guthrie followed with a two-run blast, and Cookies were up 13-1. Dinger then went deep with a solo homer, and the back-to-back jacks gave Cookies & Cream a 14-1 lead. Cookies had started the inning with 7 consecutive hits with all 7 runners scoring. Christian then retired Vassallo and Joey to end the inning, but Cookies & Cream led by 13 runs with only two innings left to play. Eastbound couldn’t get their bats going in the bottom of the fifth, as Guthrie continued to roll, retiring the side in order. Cookies would add to their lead in the top of the sixth. Christian retired Blose to start the inning, but Guthrie followed with a double and scored on a Dinger RBI single which made the score 15-1. Vassallo then cleared the bases with a two-run homer, and the score was 17-1. Joey followed with a solo homer, and the back-to-back homers put Cookies & Cream ahead 18-1. Christian then retired Blose to end the inning. Down seventeen runs, Eastbound had seen the series and their season slip away over the course of games 3, 4, and 5. Guthrie was too much for them in game 5, as he retired Ryan and Nate to end the inning, the game, and the series. Cookies & Cream had won game 5 by the score of 18-1, completing a dramatic comeback in which they won the final three games of the series after losing the first two. Eastbound’s roster, momentum, and spirit had been depleted over the course of the series as Cookies & Cream clawed their way out of the 0-2 hole. Eastbound will look to build on their successful 2015 regular season when they return in 2016 with a new lineup. With the win, Cookies & Cream advance to the Wiffle Series for the third consecutive season where they will face Questionable Outfit, who beat them in the championship series last season. – Guthrie earned the win for Cookies & Cream, pitching the complete game while allowing only one hit in 6 innings. – Christian took the loss for Eastbound & Dahn, giving up 18 runs on 21 hits in 6 innings pitched. – Vassallo led Cookies & Cream on offense, going 5-for-6 with 2 singles, a triple, 2 home runs, 4 runs scored, and 3 RBI. – Guthrie went 5-for-6 for Cookies with a single, 3 doubles, a home run, 4 runs scored, and 4 RBI. Guthrie’s 3 doubles broke the single-game playoff record of 2, previously set by many other players. 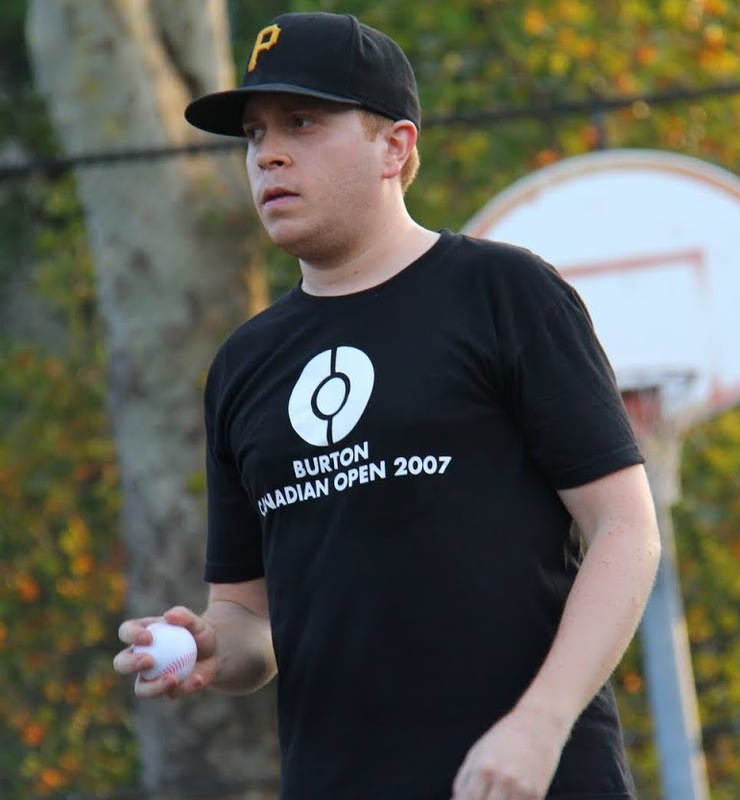 – Blose had 2 triples in the game, tying the single-game playoff record previously set by Brad (Downtown Bobby Brown) in 2012 and Tom (Questionable Outfit) in 2014. – Joey went 5-for-7 with 3 singles, a double, a home run, 4 runs scored, and 3 RBI. – Cookies & Cream tied the team single-game record for triples with 3, previously set by Eastbound & Dahn in this series. 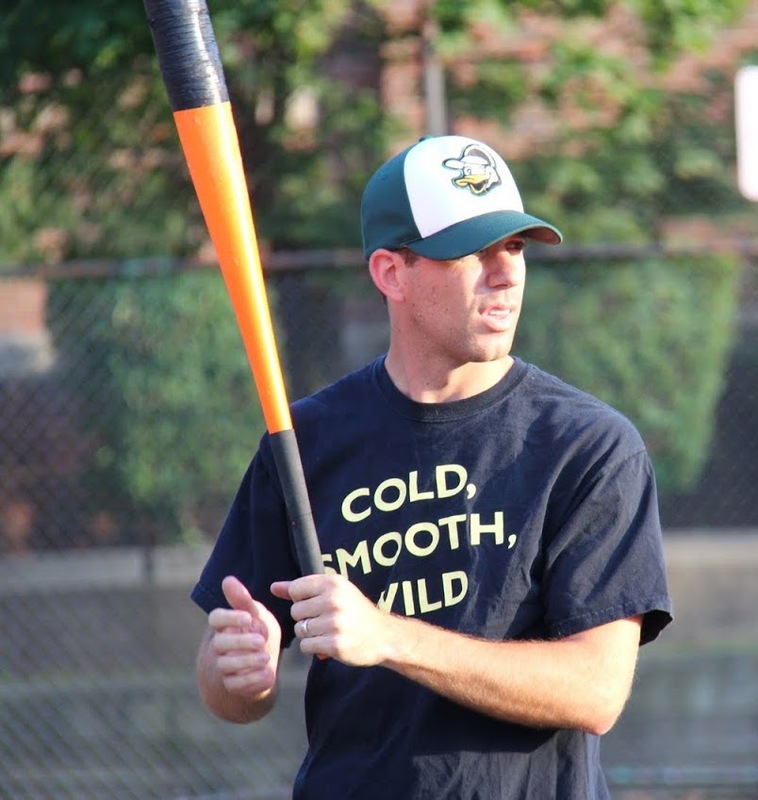 – Nate had the only hit of the game for Eastbound & Dahn, a solo homer. Cookies & Cream trailed 5-0 and were only six outs away from being swept by Eastbound & Dahn, but they rallied with 7 runs in the bottom of the fourth to take the lead and hold on to win game 3 and keep their season alive, forcing a game 4. Eastbound & Dahn’s roster was depleted heading into game 3, as they were missing their MVP candidate Morrison, who had moved to DC, their best fielder and leadoff hitter Hartley, who was out of town, and their staff ace Helal, who was out for the week. 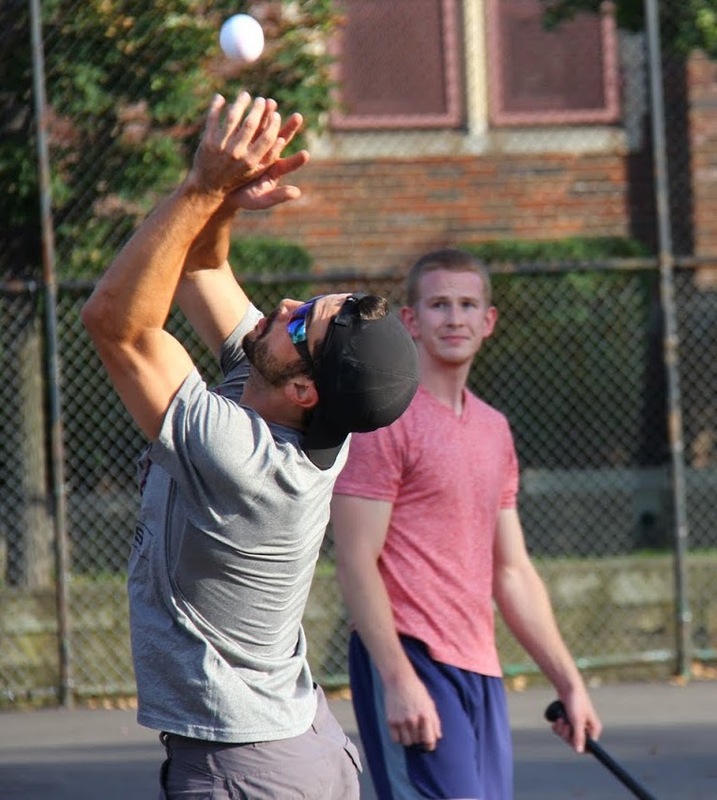 They would head into game 3 with roster regulars Christian and Nate, recent free agent acquisition Dustin, and Ryan, who would be making his EWL debut as Eastbound tried to clinch their first playoff series win and advance to the Wiffle Series. Cookies & Cream would have their full roster for the first time in weeks, playing with their 2014 playoff roster of Joey, Blose, Guthrie, Dinger, and Vassallo. 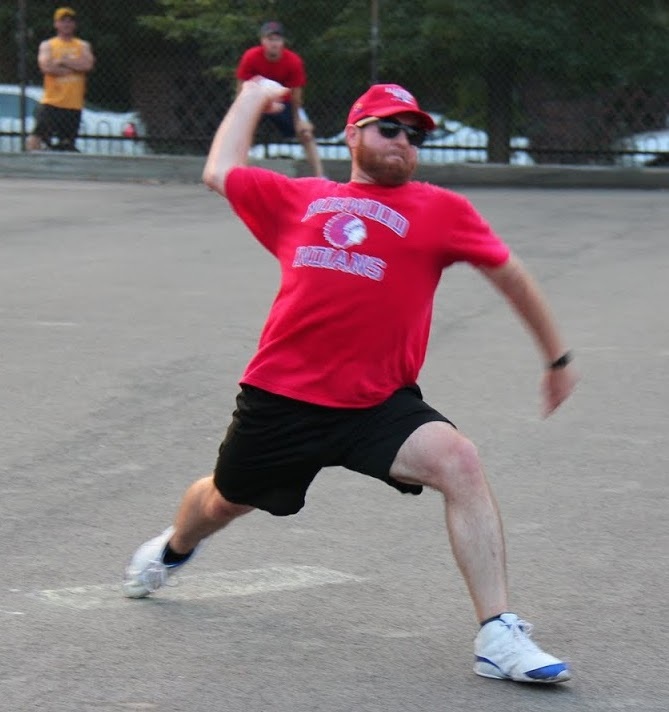 With their season on the line, Cookies started their ace Guthrie on the mound. Nate, the hero of game’s 1 and 2, led off game 3 with a double. The next batter, Dustin, singled, moving Nate to third, but Dustin was caught trying to advance the hit into a double for the first out of the inning. Guthrie then retired Christian, stranding Nate at third and ending the inning. Eastbound turned to Christian as their starting pitcher, hoping to close out the series with a win. He retired the first two batters he faced, Joey and Blose, and the game was scoreless through the first inning. Eastbound got on the board in the top of the second, taking an early lead. Ryan singled in his first career EWL at-bat, and he moved to second when Nate grounded out for the first out of the inning. Dustin then doubled, putting two runners in scoring position with one out. Christian followed with a line drive off Guthrie’s legs, and as the ball ricocheted into foul territory both runners came around to score. Christian’s RBI single put Eastbound ahead 2-0. Christian continued to roll in the bottom of the second. Dinger hit a one-out single, but Christian stranded him, retiring Vassallo to end the inning. Nate singled to start the top of the third, but when the next batter, Dustin, grounded out to the mound, Guthrie stepped on the mound to double off Nate, ending the inning. Cookies continued to struggle at the plate in the bottom of the third, as Joey and Blose were retired, and Christian had retired 6 of the first 7 batters that he faced. Eastbound would add to their lead in the top of the fourth. Ryan singled with one out, and he moved from first to third when Nate followed with a double. Dustin then hit a three-run bomb to center, and Eastbound & Dahn had pulled ahead 5-0. Guthrie retired Christian to end the inning, and Cookies trailed by five runs. Trailing by five and with only one hit, a single, through three innings, it looked as if Cookies & Cream’s season would end quietly. However, they responded in a big way in the bottom of the fourth, rallying with seven runs to take the lead in game 3. Guthrie started the inning with a solo homer to left, putting Cookies & Cream on the board. Two batters later, Vassallo hit a one-out double, and he scored on a Joey RBI single, making the score 5-2. Blose then singled to put runners on first and second with one out, and Guthrie delivered an RBI triple, clearing the bases and pulling Cookies & Cream closer at 5-4. Dinger then hit an RBI single to score Guthrie, tying the game at 5-5. Vassallo, who had missed the past several weeks, followed with a two-run blast, and Cookies & Cream had come from behind to take the lead at 7-5. Christian then retired Joey to end the inning, but Eastbound had surrendered their big lead and trailed by two heading into the fifth. Ryan led off the top of the fifth with a solo homer, the first of his career, making the score 7-6. Two batters later, Dustin doubled with one out, and the tying run was in scoring position. But Guthrie cracked down and retired Christian to strand the runner, end the inning, and preserve a one-run lead for Cookies. Blose led off the bottom of the fifth with a solo homer, putting Cookies & Cream back ahead by two runs 8-6. Christian retired the next two batters to end the inning, and Eastbound trailed by two heading into the top of the sixth. Eastbound was used to trailing heading into their final at-bat. They were down by 6 runs in the bottom of the sixth inning of game 1 before scoring 7 runs to win, and they were down a single run in the bottom of the sixth of game 2 before scoring 2 runs to win. This time, in game 3, they would need 2 runs to extend the game and 3 runs to win. Guthrie remained on the mound for Cookies & Cream, and he retired the first batter he faced, Ryan, for the first out of the inning. 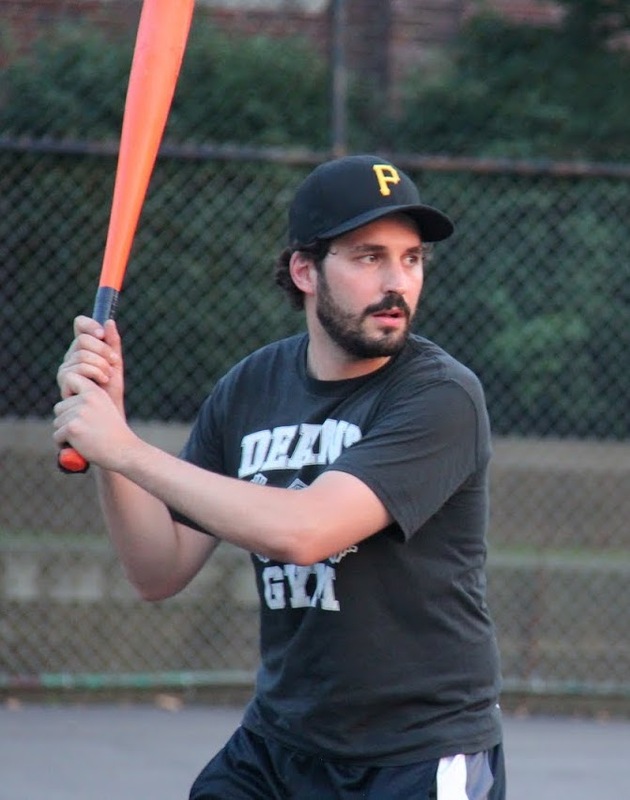 The next batter was Nate, who had won games 1 and 2 with walk-off homers. Incredibly, he hit a towering solo-homer to left, pulling Eastbound within a run at 8-7. Nate was now 4-for-4 in the sixth inning in the series, with a double, 3 home runs, 4 RBI, and 4 runs scored. It looked as if Cookies & Cream was about to blow their third straight lead in the final inning, but Eastbound couldn’t keep the magic alive. Guthrie got Dustin to fly out to right for the second out of the inning, ending the game and giving Cookies & Cream an 8-7 game 3 win. Cookies & Cream now trailed Eastbound & Dahn 2-1 in the best-of-five first round series heading into game 4. – Guthrie pitched the complete game win for Cookies & Cream, giving up 7 runs on 12 hits in 6 innings. – Christian took the loss for Eastbound, allowing 8 runs on 9 hits in 6 innings. – Guthrie and Vassallo led Cookies at the plate. Guthrie went 2-for-4 with a triple, a home run, 2 runs scored, and 3 RBI. Vassallo went 2-for-3 with a double, a homer, 2 runs scored, and 2 RBI. – Nate and Dustin led Eastbound & Dahn on offense. Nate went 4-for-6 with a single, 2 doubles, a home run, 2 runs scored, and an RBI. Dustin also went 4-for-6 with a single, 2 doubles, a home run, 2 runs scored, and 3 RBI. 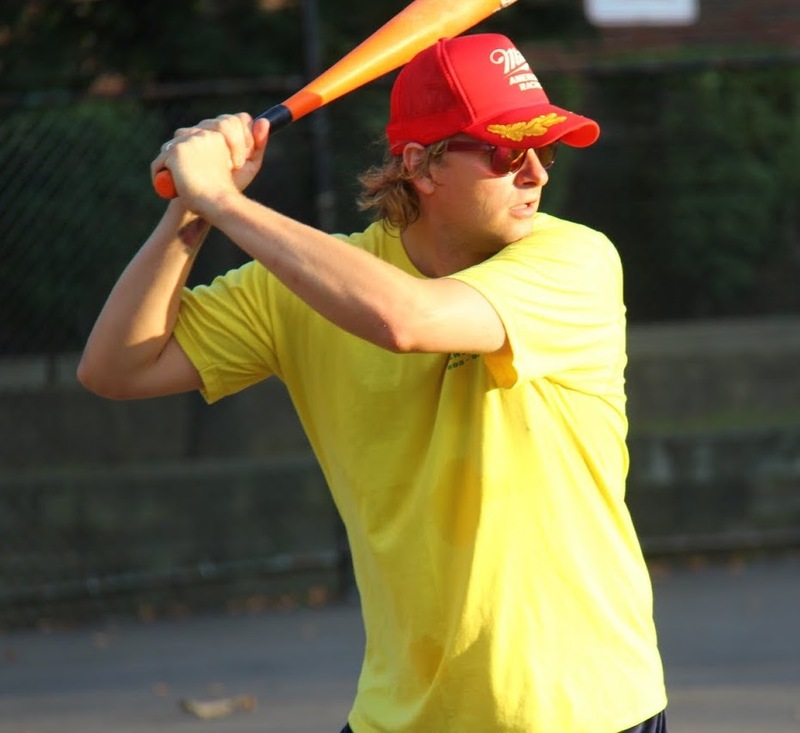 – Ryan went 3-for-5 with 2 singles, a home run, 3 runs scored, and an RBI in his wiffle debut. 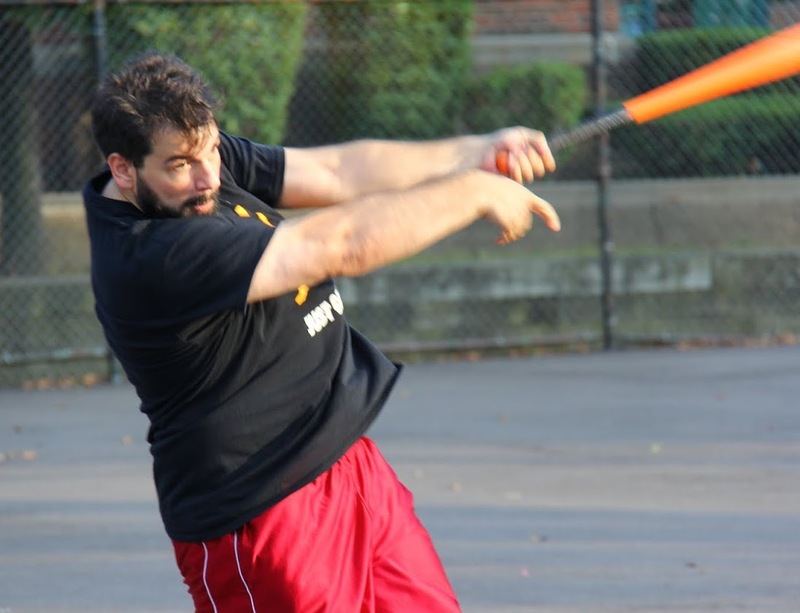 Reilly was in complete command against the Ham Slams in game 3, scattering only three hits as Questionable Outfit completed a three-game sweep of the Slams and advanced to the Wiffle Series for the third consecutive season. 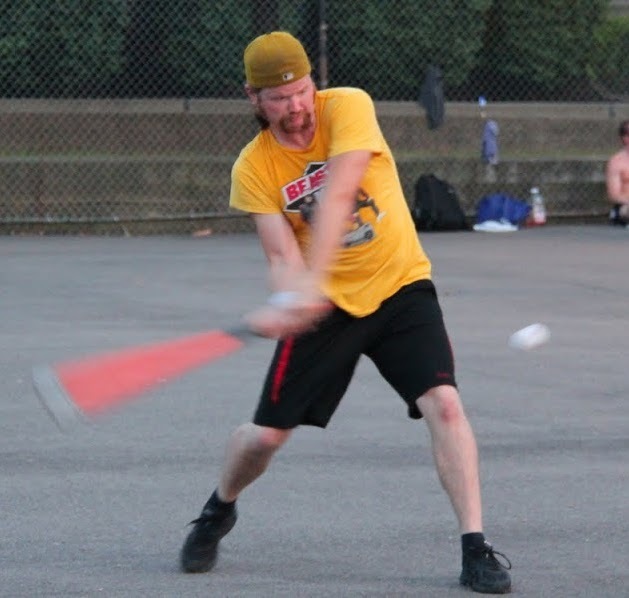 Tim kept the Questionable Outfit offense reasonably quiet, holding them to only 6 runs on 6 hits, but after letting game 2 slip away, the Ham Slams couldn’t extend the series with a win in game 3. Their season comes to an end after a strong finish to the regular season, and they will look to come back strong in 2016. Questionable Outfit continued their journey as they strive to become the first team in EWL history to repeat as champions. 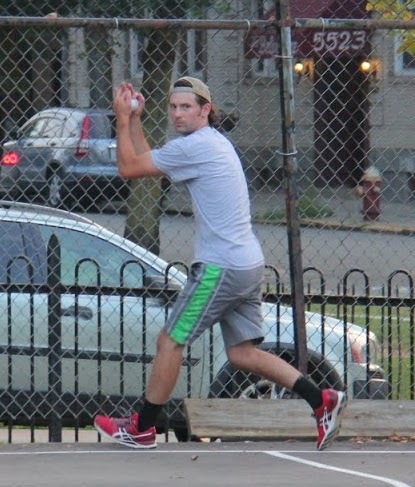 After a strong performance on the mound in game 2, the Ham Slams returned to Tim on the mound for game 3. 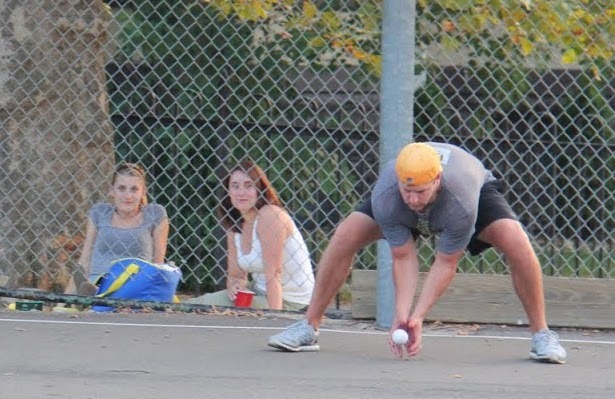 He got into trouble early, as Questionable Outfit pulled ahead in the top of the first. Bob led off the game with a double, and Tom followed with a double, scoring Bob to make the score 1-0. Two batters later, Mike hit a one-out two-run bomb to left-center, and Questionable led 3-0. Tim then retired Bob to end the inning, but the Slams were in a hole early. It would be a rematch of game 2 among the team’s starting pitchers, as Questionable elected to start their ace Reilly on the mound. He struck out the first batter he faced, Tim, who tried unsuccessfully to bunt with two strikes. He then retired Steve to end the inning. Questionable extended their lead in the top of the second when Tom led off the inning with a solo shot. Tim retired the next two batters, but Questionable had pulled ahead 4-0. Reilly cruised through the bottom of the second, retiring the side in order. Bob started the top of the third with a double, and two batters later, Reilly provided his own run support with a two-run blast to left. Tim retired Mike to end the inning, and Questionable led 6-0 through three innings. Tim led off the bottom of the third with a single and moved to second on a Steve groundout, but Reilly retired Alan for the second out of the inning, stranding the runner at second. Using a sinking pitch with spin, Tim got into a groove starting in the top of the fourth, and he retired the side in order. He wouldn’t allow another baserunner in the game. Adam started the top of the fifth with a single and moved to second when Tim grounded out for the first out of the inning. Steve then singled to put runners on the corners with one out, but Reilly buckled down and retired Alan to strand both runners and end the inning. 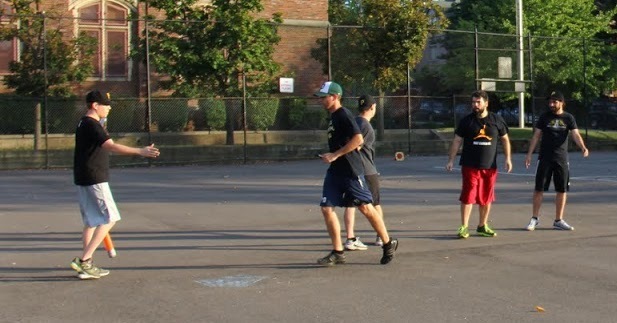 Tim cruised through the top of the fifth, retiring Reilly and Mike in order. Reilly matched him in the bottom of the fifth, sending Adam and Tim down consecutively. Tim retired Bob and Tom in order in the top of the sixth, and he had retired the last seven Questionable Outfit batters that he faced. The Slams would head into the bottom of the sixth down six runs with the season on the line. Reilly continued to mow through the Ham Slams in the bottom of the sixth, retiring Steve and Alan in order, both flying out to Mike. 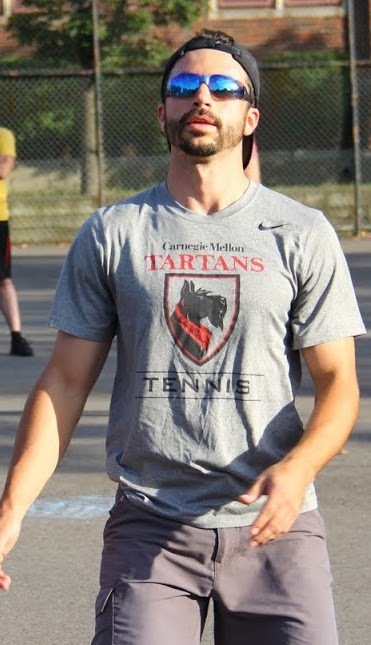 Reilly had completed the 3-hit shutout of the Slams, clinching the first round series and sending Questionable Outfit to their third straight Wiffle Series appearance. They will await the conclusion of the Eastbound & Dahn and Cookies & Cream first round series. After finishing the regular season with the league’s best record, Questionable Outfit will have home field advantage in the Wiffle Series. – Reilly pitched the complete game shutout and earned the win for Questionable Outfit. He allowed 0 runs and 3 hits while striking out one in 6 innings. 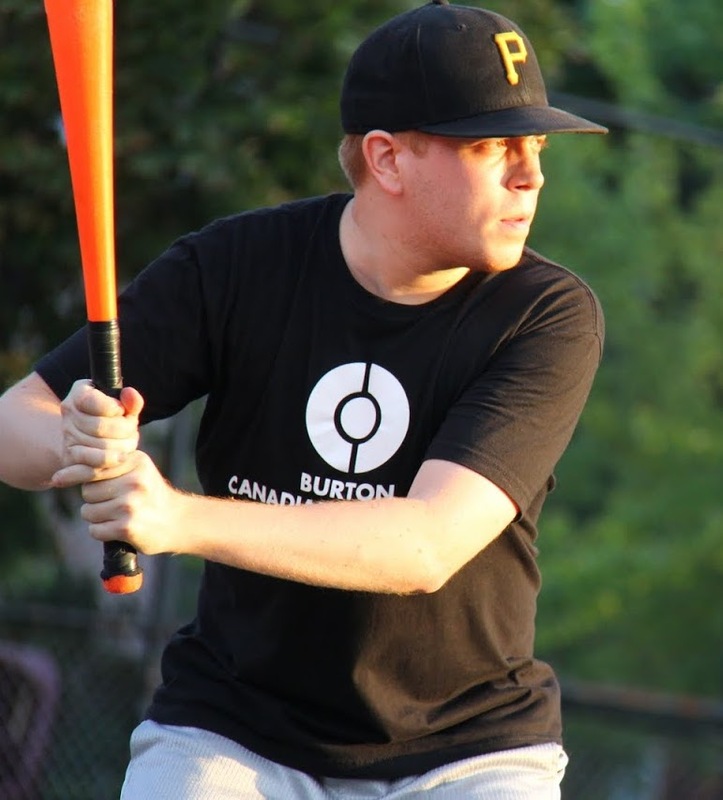 – Tim took the loss for the Ham Slams, allowing 6 hits on 6 runs in 6 innings. 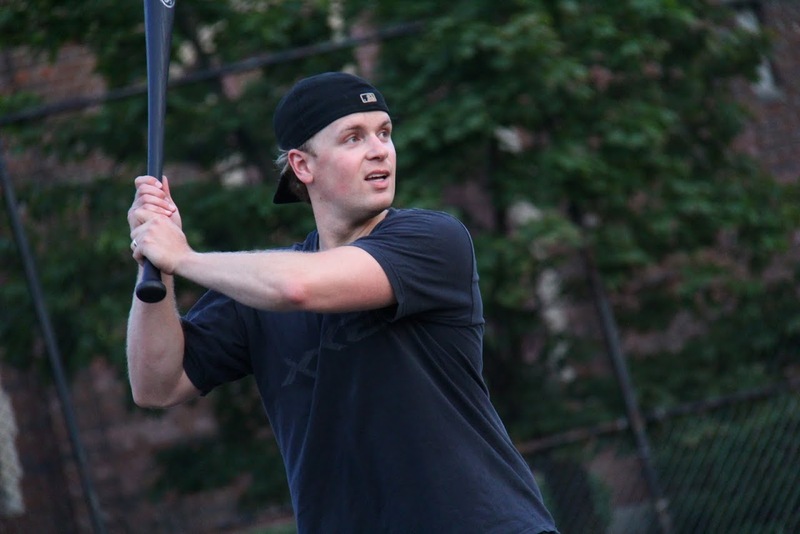 – Tom led Questionable Outfit on offense, going 2-for-5 with a double, a home run, 2 runs scored, and 2 RBI. – Mike recorded 7 putouts in the game including multiple spectacular catches in right field. – Tim, Steve, and Adam each singled for the Slams. For the second straight game, Eastbound & Dahn came into the bottom of the sixth trailing; and for the second straight game, Nate hit a walk-off game-winning homer, as Eastbound & Dahn took a 2-0 lead in the best-of-five series with Cookies & Cream in an incredible, dramatic game 2 victory. 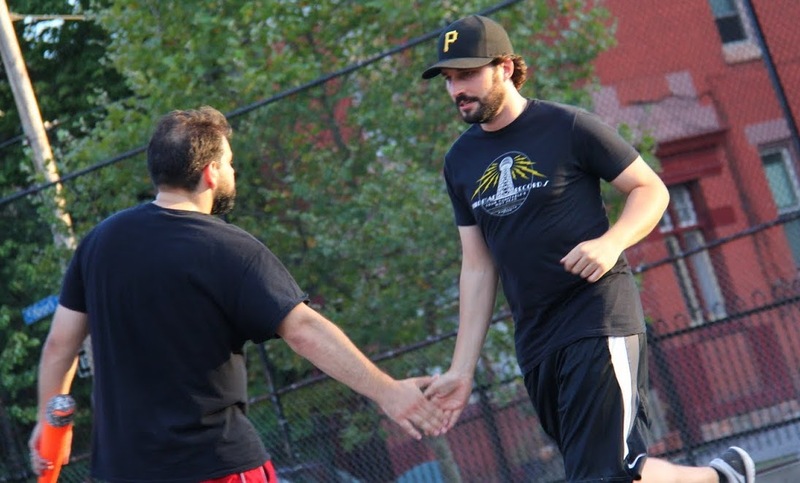 The win put Eastbound & Dahn on the brink of their first playoff series win and one game away from a trip to the 2015 Wiffle Series. Nate started on the mound for Eastbound & Dahn, and after giving up a leadoff single to Joey in the top of the first, he retired Blose and Dinger to strand the runner and end the inning. Dinger took the mound for Cookies & Cream, and he fell behind early. Tim led off the game with a double, and Nate provided his own run support, crushing a two-run bomb to left field, putting Eastbound ahead 2-0. Dustin followed with a single, and he moved to second on a Christian single. Helal then hit a ground ball to right field, which Joey scooped up for the first out of the inning. Dustin scored on the play, but Christian was caught trying to score for the second out of the inning. Down 3-0, Cookies & Cream cut into the deficit in the top of the second. With one out, Joey hit a solo homer to center, and the score was 3-1. Blose followed with a solo homer, and the back-to-back jacks cut the Eastbound lead to 3-2. Dinger then doubled, but Nate retired Guthrie to strand the runner and end the inning with a one-run lead. Dinger allowed a one-out single to Nate in the bottom of the second, but he retired Dustin to pitch a scoreless inning. Nate allowed a one-out triple to Blose in the top of the third, but Cookies couldn’t tie the game, as Nate retired Dinger to strand the runner, and the score remained 3-2. Dinger pitched a perfect frame in the bottom of the third, retiring Christian and Helal in order. Guthrie led off the top of the fourth with a single, but Cookies failed to tie the game again, as Nate retired Joey and Blose to end the inning. Eastbound would add one more to their lead in the bottom of the fourth, when Hartley led off the inning with a solo homer. Dinger retired Nate and Dustin to end the inning, but Eastbound had pulled ahead 4-2 after four innings. Cookies drew even with Eastbound in the top of the fifth, scoring two runs to tie the game. Guthrie singled with one out, and Joey followed with a two-run homer, his second blast of the game, tying the game at 4-4. Nate then retired Blose to end the inning. Dinger cruised through the bottom of the fifth, retiring the side in order, and the game was tied heading into the final frame. Dinger led off the top of the sixth with a single, and he moved to second on a Guthrie groundout. The go-ahead run was in scoring position, and Joey drove him in with an RBI single, putting Cookies & Cream ahead for the first time in the game 5-4. Nate then retired Blose, and Eastbound would trail by a run heading into their final at-bat. Eastbound had rallied from six runs down in the bottom of the sixth inning of game 1, and they would need a run to tie and two runs to win in the bottom of the sixth of game 2. Dinger remained in the game, and the first batter he faced, Hartley, hit a single, putting the tying runner on base. Nate had hit two homers in the bottom of the sixth of game 1, including the game-winning walk-off solo homer than gave Eastbound the 13-12 win. 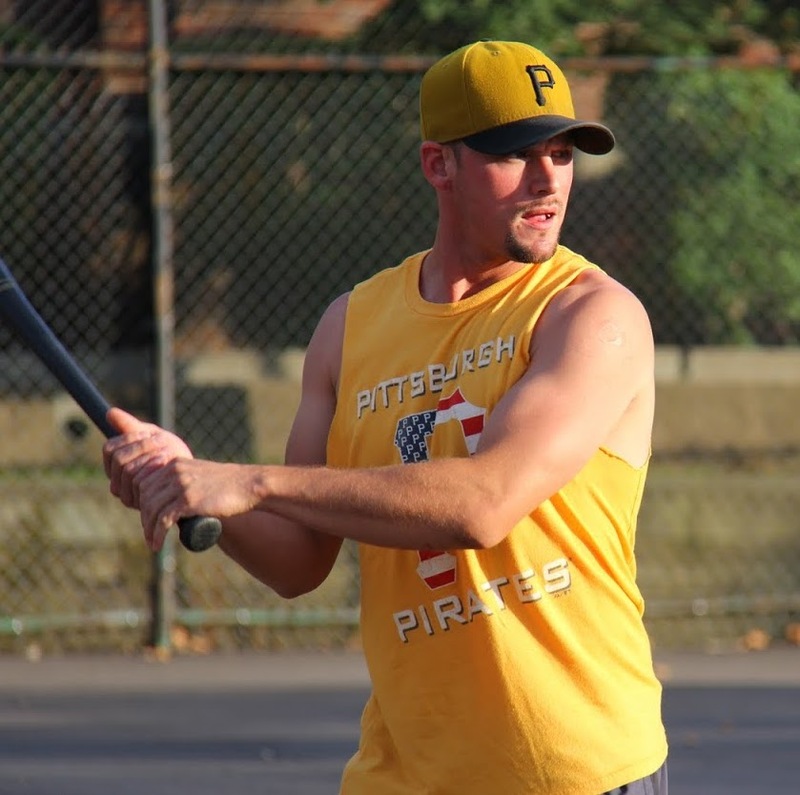 He came to the plate as the winning run, and for the second consecutive game, he did the improbable, crushing a two-run titanic shot to left field, and the walk-off home run gave Eastbound & Dahn a 7-6 win in game 2. 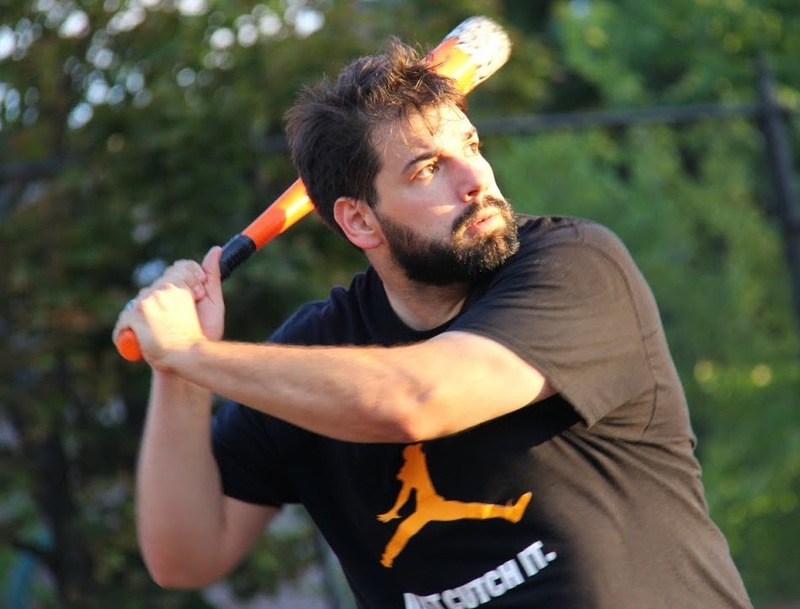 Nate had gone a combined 3-for-3 with 3 home runs in the bottom of the sixth innings of games 1 and 2, and Eastbound & Dahn had pulled ahead 2-0 in the best-of-five first round series with Cookies & Cream. – Nate pitched the complete game win for Eastbound & Dahn, allowing 5 runs on 10 hits in 6 innings. – Dinger took the loss for Cookies & Cream, giving up 6 runs on 8 hits in 5 innings. – Nate led Eastbound & Dahn at the plate, going 3-for-4 with a single, 2 home runs, 2 runs scored, and 4 RBI. – Joey led Cookies & Cream on offense, goinf 4-for-6 with 2 singles, 2 home runs, 2 runs scored, and 4 RBI.